Fredi Shaub, the owner and head chef of Bruno’s Restaurant and Bar in Thrapaya Road, Jomtien, presented a delicious menu called ‘Excursion Culinaire’ for the 2018 event of La Chaine des Rotisseurs Bailliage Eastern Seaboard. After the Assortments of Canapes which included Asian shrimp wonton cups, baby mozzarella-cherry tomato skewers, beef tartar on baked blinis and risotto balls in tomato sauce, the dinner was started by a canalone of avocado with tuna tartar, pine nut oil, salmon caviar octopus carpaccio with mango vinaigrette. Next was a delightful truffle cream soup with fresh sliced truffles, herbs and croutons followed by duckling breast lasagna baked in a crispy pastry basket. After the coconut-ginger sorbet palate refresher came the main course which was a very tasty pork Pluma steak with rioja jus, snow peas, baby carrots and garlic mashed potatoes. Then came a selection of fine French & Italian cheese with condiments and toasted brioche and finally, the desert which was tiramisu with orange mousse and fresh rasberries on chocolate-coffee sauce. The whole dinner was suberb as one would expect from a chef with such international experience as Fredi and lived up to the precedent of Chaine dinners being that little bit more special than usual. The comeraderie between Chaine dinner participants was plain to see and much laughter with plenty of ‘banter’ was abound. 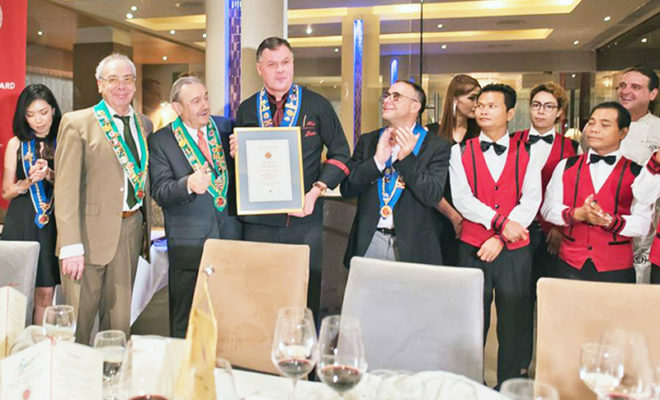 Chaine dinners are open to anyone and to find out more information about upcoming events please go to the Facebook page of La Chaine des Rotisseurs Bailliage Eastern Seaboard, or call Peter Windgasse on 080 088 7766.